Stoked to have a crack at this comp, I hope to learn some valuable insight and tips from this event, and from what I have seen so far the quality of the entries is AWESOME!! Based on the new Battlefield: Bad Company 3 being released, we have decided to go with a Battlefield Bad Company 2: Vietnam Themed Case. 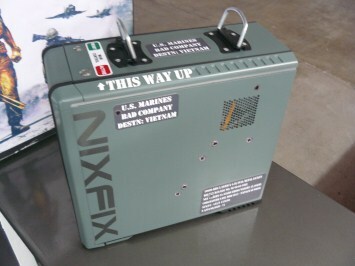 Based off a CM-690 V1.0 Case, we will attempt to simulate a Allied (US/AUS) Ammunition Box, however inside the case will be a â€œcare packageâ€ bomb, with a water cooling system to simulate a Napalm Bomb and C4 demolition system. 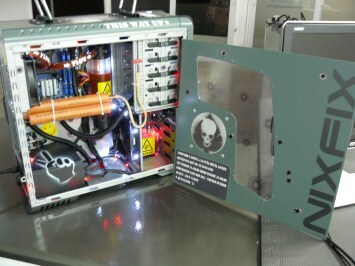 775 Motherboard, Intel Chip TBA, 4Gb DDR3 RAM etc, etc. etc. Well thats it for the moment, let me know what you think or if you have any questions, just ask away! 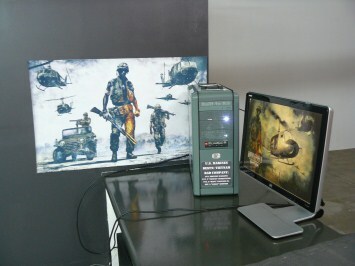 I was addicted to BF2, BF-BC2 and Vietnam and am looking forward to BF3 in the extreme. 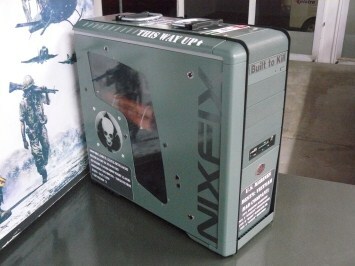 Wondering what you'll make of this case as the concept sounds cool! I had the opportunity to purchase a signal flare box which is the same as a 50cal munitions box so have this now and will be basing as much as i can off this product, amazingly, this box, its hinges, snap fastener and quick release work like the day it was made, it is an awesome piece of gear!, I have begun dis assembly of the case and made some markings for cutting, have got the mule that is loading all the software and hardware configurations doing its thing, i hadn't let this cat out of the bag, but I will be utilizing a 32Gb CF Card as the primary hdd for this machine as to keep this case as open and as clean as possible. Have still been hampered by couriers and parts availability but i will do the very best i can with what i currently have available to me. I will be replacing the mesh components with flat plate to fill things in a bit to simulate the ammo box structure, i will be attempting a wind tunnel idea for the radiator for the WC system. POLL: what do you think all, keep the 775 gear or upgrade to 1155/56 or 1366 gear??? here are a few pics of the current state of things (nothing spectacular but something never the less). Case is being painted, and honestly it is looking rather boring in the ol' OD Green, so i have now started to find some accents and paraphernalia to put on it. I have come across the Ace of Spades and other symbols that were used, so i will be adding them to the case. I have used the ace of spades but have chucked a skull in there for good measure. Second crack at painting the side panels, somehow the primer didn't stick and the paint just flaked off everywhere. Have had a few hold ups along the way, power supply seems to be on the way out and as i have opened it up the warranty is voided (typical), 1 of the rope light control boxes is shagged, so I will be buying another one of them on monday as i can't wait for a warranty replacement. 9" Dowel + Shiny Paper + Rope + Wire + Internet = Dynamite!!!! Muah ha ha ha ha ha ha!!!!!! Viewing window has now been reinstalled, with rivets, and so has the grill all painted up, the rivets on the grill have been intentionally left bare metal as to break up the colour. Trial fit of the panels and to start on the painting of the markings for the case. OK it is done, a few things haven't gone to plan but never the less i am stoked with the result!!!! This message hasn't been delivered yet. Delivery will continue to be attempted. The server will keep trying to deliver this message for the next 1 days, 19 hours and 58 minutes. You'll be notified if the message can't be delivered by that time. The final pics are not clickable to see detail (higher resolution), something happened. You might think of not using thumbnails the next time, maybe 800 x 600 clickable to hd for those interested in something done for a more seamless viewing experience. No automatic resizing like in some forums. Nice and tight carrying out of the BF theme, kudos! I thought the 2 sticks of dynamite inside were a BANG! And yes, the level is for the crÃ©me de la crÃ©me (awesome) for the most part with some gutsy guys showing of their wares too. Just one level as you know, so it is not the typical competition although anyone can enter. So best of luck! I too am "down under" (Mexico), well from the States, not waaayyy down under like you, hehe. Great job, mate!